A good yet infinitely-debatable post up on Stargazers world has us wondering, what do you use published adventures for? So many things with them can just go wrong or seem to over complicate things, do you idea mine them like we do? Recently we’ve seen a few projects in the tabletop RPG space pop up that are very similar to the Humble Bundle videogame pay-what-you-want packs. Namely the Tabletop Drop and the Bundle of Holding and while these are great both in value and in cause we are wondering exactly how practical/usable they actually are. Haste has been around for 2 years now, where did we come from and where are we headed? What makes you want to listen to the next episode? We really want to know! Thank you all for listening to us for this long! Gaming may come with huge spikes and droughts for some of us, but don’t always jump on the first chance you have to start up a group. Jumping into an ongoing campaign with near-strangers can lead to some disastrous situations. Feel everyone out first, play some one shots, invite them over for a non-RPG function to see how you mesh before “jumping into the sack” with them for a long campaign. It may save you a lot of time and headache. @ForbesTay (Taylor Forbes) asks: When wanting to play multiple systems should we alternate weeks or do mini campaigns? Here is my shout out to say I’m listening. I game on myth-weaver, but I respect obsidian. I’m in a drought. I haven’t found a gaming group for a couple years. I say this even though I’m in a monthly od&d game as a player and a couple pbp online (Pathfinder & paranoia). I miss running games. Anyway, way to go on your longevity. I listen to cannon puncture, happy jacks, fear the boot, miskatonic university, narrative control, save or die, root, and a few others . Yours is good and topical, fits in with the others. Add my email to an announcement list when you’re got your g+ going. Awesome Shawn, thanks for your feedback. I’ll definitely let you know once the G+ group is finalized. I love the short form. If I ever have to cut back my long, long list of podcasts, the short length and quality content will put you at the top of the list that I keep. I’ve got plenty of podcasts that are fun but ramble for an hour or two and there are days where it feels like a chore. I also like that you’ve got a variety show thing going on. It keeps things interesting in that you mix it up. I enjoy hearing about games, kickstarters, and, yes, even the occasional kicking of the dead horse with a gaming tip or discussion. Keep up the great work guys! You really are the RPG hobby news source as far as I’m concerned. Jennisodes is where I go for longer interviews (used to go I guess), Happy Jacks for rambling fun with occasional insight into gaming and groups, and Ken and Robin for my intellectual RPG/random discussions. I’m glad we’ve got such a mixed and vibrant podcasting community and you guys are one of the pillars. Firstly, I want to chime in that a G+ page is an excellent idea. (Well, more like “It’s about time,” but better late than never. 😉 Seriously, Jerry, I’ve been following you on G+ for ages, so I know you use it; I was really starting to wonder how long it would take for you guys to get around to making an OP page on there….) In my experience, the conversations in the comment threads on G+ are usually of markedly better quality than on Facebook, for whatever reason. Secondly, I was glad to hear you recommit to keeping the podcasts short and focused. You asked what we like about them, what keeps us coming back, and for me, that’s half of it. I don’t have a lot of time for podcasts, and you guys cover several topics in a reasonable time. I’ve occasionally heard podcasts that are perfectly good and interesting, except they talk on a single topic for an hour and a half; I don’t listen to a single one of those on a regular basis. I’m not sure if that was helpful at all, but it was certainly long, so there you go! Thanks for the timely, focused podcasts. Too many of your competitors don’t understand the format, and produce audiobooks instead. And btw, I’m a happy user of Obsidian Portal. 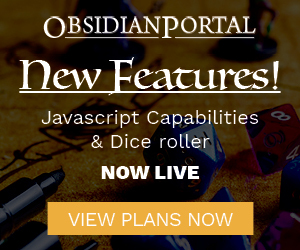 I didn’t back the Kickstarter because Obsidian portal does what I want it to do, I don’t need new features. I love the fact that you don’t shill OP all the time on your podcasts, for one. The variety is the main reason I listen- there is always something new. I also am glad they are 30-40 minutes- that helps. The other reason is that you both, and typically your guests as well, have varied opinions. It is ok to disagree, and not make it a flame session! Keep up the great work, both on the site and on the podcast! With my current group, I met everyone for a drink before getting into the game, which even after I had to move out of state, I am till running thanks to Roll 20. As for published adventures, I run both. My homebrew stuff is often based around published stuff and I also use a choose your own direction style. Love the show, the only podcast I actually listen to because of the short format. A lot of the stuff is relevant to my interest, though I only play Pathfinder. Glad to know that even though you only play Pathfinder you still enjoy the show, and that we’re a podcast that typical non-podcast people enjoy. Being one of those people myself that’s a good thing I think, we always aim to keep it short and sweet. Speaking as one of your silent but loyal listeners I’d love to hear more Obsidian Portal. Perhaps as an occasional feature if I’m in the minority or more frequent if others appreciate it. The tips for GMs and players are a nice feature you do already. But how taking a look at how other users are using the site: talk about the campaign of the month; or this weeks episode is brought to you by Featured Campaign of Week/Episode – you could highlight some creative user even if its just for a single page. You already have a very interactive community and this might help make more of a community show. Take audio comments from users plugging their games or looking for players, interview the DM of the Month live. Oh and frequent updates on the Reforge. Otherwise keep doing what you’re doing and we will keep listening. Llowellen – thanks for the feedback, we really appreciate it.! I keep meaning to post, but I usually listen to the Podcast on my way to work and forget by the time I get home. Here’s why I keep listening: I can listen to the whole thing on my ride to work!!! I have other podcasts and they are 1-2 hours in length and that’s a bit long in this day and age (I don’t usually finish the whole thing). Keep up the good work. In regards to adventures, I’ve played with both types and I’ve found that GMs that use published adventures as a frame work have a better structure to their games. Game master’s that run their own thing I find have some good ideas, thrown into their whims of reacting to the players. If ever I feel that player agency is sacrificed is when a GM is flying completely by the seat of his pants. 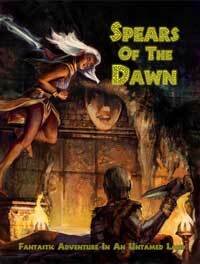 I don’t think a published adventure can account for every idea the players may have, but if the GM has a clear plot line, then they can react better to choices that the party makes. I find one of the Deadly Sins of running an adventure is putting the adventure on the table. You should know the adventure enough not to need it at the table and NEVER-EVER read those block quotes in adventures… most people can’t read well enough to get the information across, it’s better to ad-lib what is happening. I’m fairly new to your podcast, but it’s the best rpg-cast I’ve found yet. You guys are my go-to for gaming news. I love how the podcast is so well structured – you stay on topic, move from one item to the next, and you keep it all interesting. I love your gamemastering advice and your more general gaming advice. I love hearing stuff about interesting game mechanics and short game reviews. I also like hearing from designers and short interviews. Keep up the awesome work and I’ll keep listening and spreading the word of your podcast. Thanks so much. Thanks for the Kudos, we hope to keep you listening for quite some time to come!